offer to work in his cotton firm, Musson, Prestidge & Co., Cotton Factors and Commission Merchants. and exporting wine and cotton. in 1872; Edgar Achille Gaston, in 1875 and René Henri, in 1876, only Odile and Edgar Gaston survived the illnesses in the 19th century in the States. René’s misfortune continued. Not only did he borrow money from his father, Auguste De Gas, which contributed to the lost of most of his family’s fortune and bank in Paris, when he could not repay his debt; he also eloped with his neighbor, America Durrive Olivier, on April 13, 1878, one year after the death of his last son with Estelle. the godmother of René and Estelle’s son, Gaston De Gas. After obtaining false divorce papers, the couple married, bigamously, in Cleveland, Ohio. René then legally married America Oliver in New York after divorcing Estelle. In 1879, René De Gas returned to France with his second wife, America, with her first two children, Odile and Frederic, from her previous marriage. They had three children of their own, Maurice, Edmond and Odette. In 1883, Michael Musson, René’s father-in-law, adopted his grandchildren, Odile and Gaston, changing their last name to Musson while retaining DeGas as their middle names. They became Odile DeGas-Musson and Edgar Achille Gaston DeGas-Musson. The children never saw their father, René, again. René never succeeded in business, but did reconcile with Edgar. 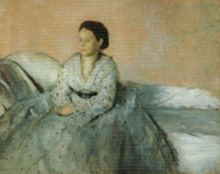 When Edgar Degas died in 1917, René inherited half of his estate. The children of the De Gas family in Paris were never aware of their surviving half-brother Gaston and half-sister Odile from New Orleans until they contacted the French court to contest the will after René’s death. 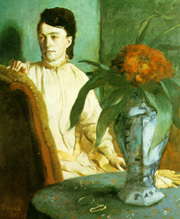 Estelle died in 1909, eight years before the painter. René died in 1921; a great part of his inheritance after ten years was divided between the two surviving families – the De Gas-Mussons in New Orleans and the three remaining children – the De Gas-Oliviers in Paris. New Orleans Museum of Art: Museum Purchased through Public Subscription Fig. 14. Musee d’Orsay, Paris Fig. 15. Chester Dale Collection, National Gallery of Art, Washington, D.C. Fig. 12. Degas and New Orleans: A French Impressionist in American, 1999, New Orleans Museum of Art, page 87. Fig. 13. Degas and New Orleans: A French Impressionist in American, 1999, New Orleans Museum of Art, page 211. Fig. 14. Degas and New Orleans: A French Impressionist in American, 1999, New Orleans Museum of Art, page 209. Fig. 15. 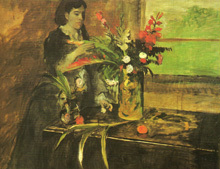 Degas and New Orleans: A French Impressionist in American, 1999, New Orleans Museum of Art, page 210.